a quick red fox: swamplandia! The Bigtrees are alligator wrestlers who run a theme park on an island in Florida. After mother Hilola dies of cancer, Swamplandia! hits hard times and the family copes in various ways. Kiwi, the brother, runs away to nearby Loomis County to raise money and get an education. Chief Bigtree, the father, goes to the mainland on an extended business trip. Osceola, the older sister, runs away with her lover (who is, I should mention, a ghost), and younger sister Ava journeys into the Underworld of the swamp to bring back her sister. With its crazy premise and lively setting, I was prepared to love "Swamplandia!" 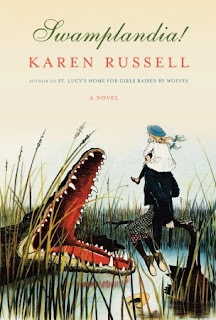 It's gotten a lot of praise in the literary world and I've heard wonderful things about Karen Russell's short story collections. Unfortunately, it didn't live up to the hype for me. Although the introduction to Ava, her atypical family, and their island home was enticing, I quickly grew bored. I wish that a big hunk had been chopped out of the middle, when nothing seems to be happening, especially on Ava's end; Kiwi's sections were far more interesting to me. Plus, it was difficult to read about Ava's trip with the mysterious Bird Man because she seemed so naive and he seemed so creepy. I knew something bad was bound to happen, and I was frustrated that Ava didn't realize it too. Finally, part of what drew me to the book was the magical realism element, the idea that Osceola is really in love with a ghost, so I was disappointed that Osceola and her ghosts are only a side story and absent for much of the novel (and not really written in the style of magical realism). I considered giving this three stars simply because I loved the setting, the concept, the characters, and some of the writing, but ultimately I knocked it down to two. The plot was too frustrating and drawn-out for a positive review. However, because I really liked Russell's ideas and writing, I am excited to get to her short story collections soon. VERDICT: 2/5 stars. Great concept and characters, lackluster story. Lovely review! I can't wait to read this myself. I had already decided not to read this book, but I was curious to see what your opinion was. Having heard about what happens during the tense parts of the book, I really just have no desire to put myself through that.